Did you know that May 7 is Free Comic Book Day? 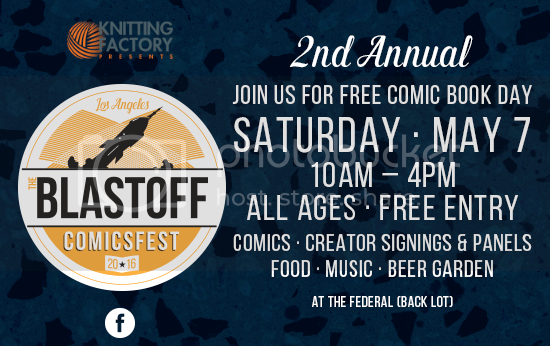 So Knitting Factory Entertainment and Blastoff Comics have teamed up to bring comic book fans an afternoon to remember at Blastoff Comicsfest on Saturday, May 7 from 10AM-4PM at The Federal Bar NoHo. Come visit with comic creators from Marvel; Dark Horse; IDW Publishing; DC and more, as they sign comics, give away free sketches and meet one-on-one with fans young and old. Admission to the festival is free. There will also be a beer garden, food stations, live DJ, costumed hero photo ops, and of course, plenty of free comics! In addition, the festival will feature a special ticketed event: Hollywood Writer’s Roundtable. With comic books and genre literature increasingly becoming the most popular source for television and movies, it makes you wonder: How do you go about properly adapting work from one medium to the other? Is there such a thing as being “too faithful”? What’s more important, the words on the page or the spirit of the work? Appearing at this ticketed event to talk it out are screenwriter Carl Gottlieb (JAWS, THE JERK); director Nicholas Meyer (STAR TREK II: THE WRATH OF KHAN, STAR TREK VI: THE VOYAGE HOME); Executive Producer Quinton Peeples (Netflix’s IRON FIST); writer Brigitte Hales (Hulu's 11/22/63, ONCE UPON A TIME); and writer Jim Kreuger (THE HIGH COST OF HAPPILY EVER AFTER, JUSTICE). This event will be moderated by Michael Stradford, Director of Enhanced Content for Warner Home Entertainment. Comic creators scheduled to appear at the festival include Cecil Castellucci (Star Wars: Moving Target, Plain Janes); Christos Gage (Rom: Spaceknight, Buffy the Vampire Slayer: Season 10); Joelle Jones (Lady Killer, Superman: American Alien); Nicholas Meyer (The Seven-Per-Cent Solution, Star Trek II: The Wrath of Khan); Steve Niles (The October Faction, Monster and Madman); Jamie S. Rich (Lady Killer, Ares & Aphrodite); Chris Ryall (Rom: Spaceknight, String Divers, Onyx); Tad Stones (Darkwing Duck, Hellboy: Sword of Storms); Craig Thompson (Blankets, Habibi, Space Dumplins); and Chris Yost (X-Men, Avengers). TICKETS to Hollywood Writer's Roundtable. See you at Blastoff Comicsfest!